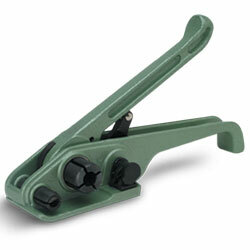 Heavy-duty side action crimper. Designed to be used with poly strapping. 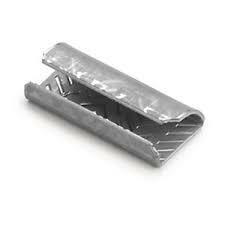 Joins ends of strapping together crimping or deforming one end to hold with the other. Offset serrations in tool will bite into the strap. Tool fits 1/2″ wide strapping. 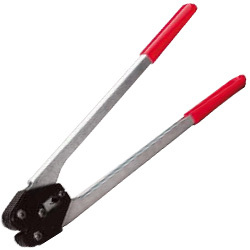 Heavy-duty side action crimper. 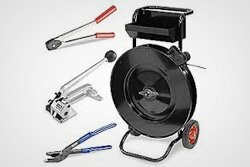 Designed to be used with polyester strapping. Joins ends of strapping together crimping or deforming one end to hold with the other. Offset serrations in tool will bite into the strap. Tool fits 1/2″ wide strapping. Polyester Strapping Serrated Seals 5/8"
Serrated strapping seals are grooved inside of the seal to provide strong grip on smooth polyester strapping. Rust proof. Seals are 1/2″ sized and 1.25″ long, with .030 mil gauge. 1,000 per case. Polyester Strapping Serrated Seals 1/2"
Serrated Strapping Seals are for Polyester Strapping only.